We believe the comfort and security a swaddled baby feels is universal. But we also find that not every parent feels as secure in his or her swaddling skills. While we try to make swaddling as simple as possible (have you read “How to Swaddle”? ), we are realists and get that traditional swaddles are not for everyone. But there’s no shame in your swaddling game. 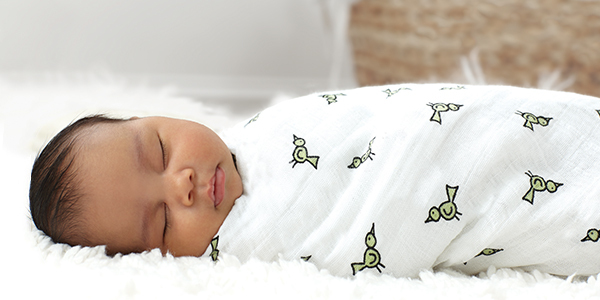 Our easy swaddle may be just what you need. Complete with adjustable snaps, this wearable swaddle blanket is the no-fail approach to the time-honored method, taking the guesswork out of when to fold and where to tuck. In just four simple steps, your little one will be cradled in the comforting goodness of muslin and you will feel like an accomplished swaddler. Slide baby into easy swaddle, gently place baby’s arms across chest slightly bent at the elbow and tucked into the opening. Fasten the snaps at the top, making sure baby’s arms stay tucked in. Take the left side of the easy swaddle and bring it across your baby’s chest. Take the right side of the easy swaddle and bring it across your baby’s chest.